This year’s special event: LEGOs! Achievement unlocked! We can’t tell you how many times we heard that at php[tek] last year, as we ran our achievement patch program. (Nor how many times we’ve been asked for help completing a set since then). We had so much fun with the patches that we knew we had to come up with something epic this year. What’s more epic than patches? LEGOs. What’s more epic than LEGOs? Our very own custom LEGOs! A few of them are shown on the right, but there will be more. Dust off that inner child, and start getting creative! At the main conference party, we are going to have LEGO building contests (yay, prizes! ), and there is also a special conference T-shirt for those who manage to collect the sponsor LEGOs. 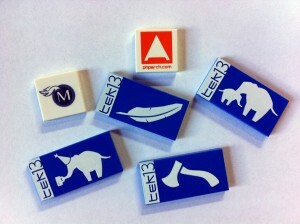 As usual, you’ve got to be there to collect them all, so make sure you have a ticket to php[tek]. Love food? So do we, so we are making absolutely sure that you will not go hungry at tek. Thanks to the generosity of our sponsors, we will be providing breakfast for attendees every day of the conference. As usual, we will also be having lunch service each day and coffee available throughout the conference. Planning on attending the evening parties? This year we will be catering to the more refined palettes that we know exist in our beer-aficionado guests. In addition to a wide variety of wine, we will also be providing a full slate of beers from a local Chicago brewery, Goose Island. We will have their IPA, 312, Honker’s Ale, and Nut Brown available. And even though we won’t be serving food, if you are around on Tuesday evening, don’t forgot to join our Birds of a Feather discussions Tuesday evening. These will be held in the atrium bar of the hotel and are a great place to get to know each other, greet other attendees as they arrive, and if you are hungry, the bar does serve a full dinner menu, so you can find food while you’re there. We’ll see you in Chicago in just 3 weeks! WordPress has tens of millions of users worldwide and powers over a fifth of new sites. But such a large and diverse user base presents unique challenges, and as it approaches its tenth birthday, the WordPress codebase is showing its age. So why is it so ubiquitous?The answer lies not in its UI, UX, ecosystem, or community, though those are certainly among its strengths. The answer lies instead in a core philosophy that holds the user above all else. This user-centric design starts not with the interface, but rather with the code itself. Developers should approach software development with an unwavering promise they will deal with the nonsense instead of passing it off to the user. Some WordPress positions might seem draconian and inflexible. Backwards compatibility is almost never broken. The technical requirements appeal to lowest common denominators. But because the project maintainers deal with all the pain — technical debt, difficulties with PHP, working on as many server configurations (and misconfigurations) as possible — its users don’t have to. Thanks to the WordPress project’s portability efforts, you can pick a web host or a PHP configuration at random and WordPress will run on it. Because of this, adoption has soared. The way WordPress operates is not for everyone. But whether your projects are used by 10 users, or 10 million, it may help you to see your code in an entirely new light. Andrew Nacin is a lead developer of WordPress, wrangling contributions, spearheading initiatives, advising new development, and squashing bugs. He led the last major release of WordPress, 3.5, which overhauled media handling. He is also a member of the core security team. Just as many PHP core developers have with PHP, he and WordPress have a love-hate relationship. If he thought it was perfect, he would find another job. He feels strongly about the core philosophies of WordPress, among them “decisions, not options” — software should be opinionated in lieu of burdening the user with too many options. He works for WordPress founder Matt Mullenweg at Audrey Capital, where he is primarily tasked with working on WordPress core and keeping the lights on at WordPress.org. He resides in downtown Washington, D.C., with his wife. You can follow him on Twitter at @nacin. We’ve recently published both iPhone and Android apps for tek13 this year. You can use them to make your own personal schedule, find extra information such as sponsors, local attractions, conference map, and much more. Plus it will receive updates over the air if we need to change anything. We’re grateful for the support we’ve received from the community over the years, and as part of our contribution to help strengthen the PHP community, we’re pleased to announce that our special event this year is a Mentorship Summit! As PHP continues to mature, the community will need to expand, and programmers new to it will need to build on the experience and knowledge of those who paved the way. There are great efforts online like PHP the Right Way, but an age-old method is still necessary: mentorship. Inspired by Elizabeth Smith’s Mentoring Developers talk, we’re having a series of lightning talks on mentorship: both how to be a mentor and how to get mentored, especially in an age more online than in the office. Don’t think you know enough to mentor someone else? You might be surprised! The Summit will take place in the keynote room. We’ll serve pizza during the event, and afterwards we’ll segue right into the opening night party so you can connect with mentors and mentees. Everybody gets Imposter Syndrome from time to time, even the “Big Names.” What can you do to fight off that sinking feeling? With so much new information always ready and waiting, how do you decide what to research and learn? Learn from Grumpy Programmer Chris Hartjes how he built his skills by spotting opportunities. What happens when you take the concept of mentoring, an arrangement between a mentor and a mentee, and apply them to the PHP ecosystem as a whole? This session will explore ideas about mentoring on a community scale. Technology moves quickly, mentoring allows us to stay on top of the current trends and advances our quest to master certain topics. What happens when mastered skills and mentoring experience are brought from the community to the work place? This session will talk about mentoring and being mentored can be used to drive positive change in an organization. Closing the circle, Elizabeth will draw together the common themes of these talks, offer some final thoughts, and challenge participants to continue the discussion and look for opportunities to mentor and be mentored. We are excited to announce today our keynote for tek13. It will be titled “Practicing Failure” and will be co-presented by Harper Reed (former CTO for Obama for America) and Dylan Richard (former VP of Engineering for Obama for America). They will chronicle their experiences working on the technology behind the 2012 re-election campaign including how they had to build a team (fast), create products that had to scale to massive levels, and all of this had to ‘just work’. They had a hard deadline, as you can’t just push off a code release deadline when that deadline is election day. Of specific note: they will be discussing the disaster drills that they ran to prepare themselves for anything that could (and did) happen. Harper and Dylan are both long time Chicago residents, and have been seen in the hallways of tek in years past. We think it’s great that they’ve agreed to be our opening keynote for tek this year, and share the unique experience that they had and lessons that they learned. We are excited to announce more details about the Uncon at tek13! This year we are honored to have Michelangelo van Dam (@DragonBe) serve as our Uncon chair. Michelangelo has done this for numerous other conferences in the past and we are deeply thankful to him for agreeing to help organize our Uncon as well. As far as the Uncon itself goes, we are changing the format this year. Most prominently, we are moving Uncon away from being an evening event. The Uncon will be a full track and have first class status. We feel this change is long overdue as the Uncon content is quite often amazing and can include “hot off the presses” content on new technologies that didn’t even exist when the original schedule was decided! So this year the Uncon will run all day long on Thursday, May 16th. What sessions appear in the Uncon? Well, that’s up to our attendees! On the first day of the conference (May 15th), we will have a board set up near the registration desk, where you can write in any talk idea that you’d like to give. But best of all, every single attendee should stop by that board throughout the day, and vote on what talks they would most like to see by putting stars next to them. At the end of the day, Michelangelo will take a look at the board and make a decision on what looks like the best lineup for the Uncon schedule itself. It will be primarily based upon the voting of the attendees, but we are giving Michelangelo full control to make decisions on what talks will make the “best track” overall (for example, excluding a talk that is really a duplicate of another). We will then make an announcement of the schedule, both at the party that night and at the next morning’s keynote. We’ll even update the online schedule with the information so you can look it up. Thanks again to Michelangelo for helping us out. We are looking forward to another great Uncon! We have a big announcement this year. Because we had over 400 amazing talks submitted to us, and we just couldn’t bear to decline that many of them. We are expanding the tek13 conference format to include 4 concurrent tracks this year! The conference schedule and speaker list are now published, so you can now browse through them at your leisure. Well this year’s call for papers has come to a close, and we had a record breaking number of submissions with over 400 talks being submitted to this year’s conference! We now have a daunting task ahead of us to review all of these and then turn them into an amazing (and balanced) schedule. We don’t want to commit to a hard date that we’ll let speakers know and release the final schedule, because if we do, I’m sure we will miss the date and just upset everyone. However we are going to aim to have the schedule announced by the end of the month (or early in February). So we’ve been hearing rumors that tek13 wasn’t even going to happen this year. Nonsense! We’ve been extremely busy behind the scenes getting organized as we’ve been working on the transition of the PHP|architect brand from Blue Parabola to Musketeers.me. Eli, Sandy, Oscar, and Kevin are planning on carrying on the great tek tradition of quality content and community that we’re all used to from the BP crew! To ensure this we also are hiring Beth away from BP to join the Musketeers team and continue to support the conference (as well as all other aspects of the brand). We’re also accepting sponsors for tek13. Sponsoring php[tek] is a great way to reach out to a vibrant, well-connected and highly professional community of developers and technical managers. Feel free to contact us to receive our prospectus and discuss your options. Tickets for attending tek13 will be available soon. Look here the next couple of weeks for your blind-bird & early-bird specials! You can follow @phparch for timely updates on php[tek]. The conference's official hashtag is #tek13.